In 2001 Russian President Vladimir Putin decreed a Federal Military Memorial Cemetery to be built in Moscow for burying top politicians of the USSR and Russia. Photo: Federal Military Memorial Cemetery. The Defense Ministry has cut funeral expenses for government leaders in a bid to trim spending, although special privileges for deceased top officials will remain. The economic crisis in Russia is forcing not only civilians but also entire ministries to reduce their expenses. This has even affected specific areas such as funerals: The Russian Defense Ministry has reduced its anticipated budget for burying top government officials (presidents, prime ministers and ministers) by almost 50 percent, from 1.1 million rubles ($19,000) to 706,000 rubles ($12,000). 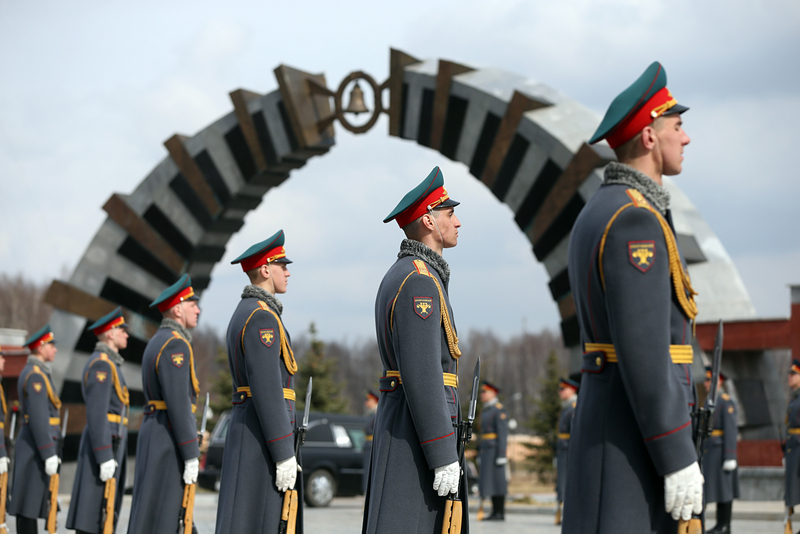 However, the Defense Ministry has allotted up to 3,927,000 rubles ($62,000) for presidents' funeral monuments, while up to 3,575,000 rubles ($57,000) has been allocated for prime ministers and ministers' tombstones. Such sums are also provided for burying chairmen of the Federal Assembly chambers, marshals, army generals and fleet admirals, as well as civilians decorated with the Order of St. Andrew or the Order "For Merit to the Fatherland" of the 1st class. Meanwhile, the Defense Ministry proposes to spend from 322,000 to 436,000 rubles ($5,000-7,000) for funerals for servicemen and Interior Ministry officials who have died protecting the interests of their country. The difference in the cost for burying presidents, ministers and servicemen is determined by their positions, which require separate services to be paid for by the government. "Some have a tombstone with a bust, others without," said a Defense Ministry representative. Top government officials also have it slightly easier than civilians when it comes to choosing the place of burial. In 2001 Russian President Vladimir Putin decreed a Federal Military Memorial Cemetery to be built in Moscow's Mytischinsky neighborhood for burying presidents of the USSR and Russia, chairmen of the Supreme Soviet of the Soviet Union and the Russian Federal Assembly chambers, as well as chairmen of the Council of Ministers of the USSR and Russia. The government order that described the function of this cemetery in detail was issued in 2004 and the first burial took place in June 2013. The rules say that besides top government officials, servicemen and decorated civilians may also be buried in this cemetery, as long as it does not contradict the will of the deceased or the desire of his or her relatives. The cemetery is located on a plot of more than 50 hectares. Its Heroes Avenue contains 24 bronze sculptures of warriors styled to represent six historical epochs: from Dmitry Donskoi's soldiers to modern Special Forces agents. Today the cemetery has 26 graves, including that of legendary weapons constructor Mikhail Kalashnikov, constructor of combat missile technology Sergei Nepobedimov, former Russian Defense Minister Igor Rodionov and Marshal of the USSR Vasily Petrov. It can be visited only if you have a special burial passport or as part of organized excursions. Previously, Russian statesmen were buried in Moscow’s Novodevichy Cemetery. This is the resting place for Russia's first president Boris Yeltsin, USSR President Mikhail Gorbachev's wife Raisa, First Secretary Nikita Khrushchev, USSR foreign ministers Vyacheslav Molotov and Andrei Gromyko and former Russian Prime Minister Viktor Chernomyrdin. In contemporary Russian history there has been only one burial of a head of state: first Russian president Boris Yeltsin, who passed away on April 23, 2007. His coffin stood in the Cathedral of Christ the Savior for the national farewell ceremony. More than 25,000 people visited the cathedral in three days. Yeltsin's funeral took place on April 25 and was attended by former and current leaders from all over the world, including former U.S. presidents George Bush Sr. and Bill Clinton, former German chancellors Gerhard Schroder and Helmut Kohl, former Uzbek President Islam Karimov, Belarusian President Alexander Lukashenko, and Kazakh President Nursultan Nazarbayev.